Updates from InterBEE in Tokyo. 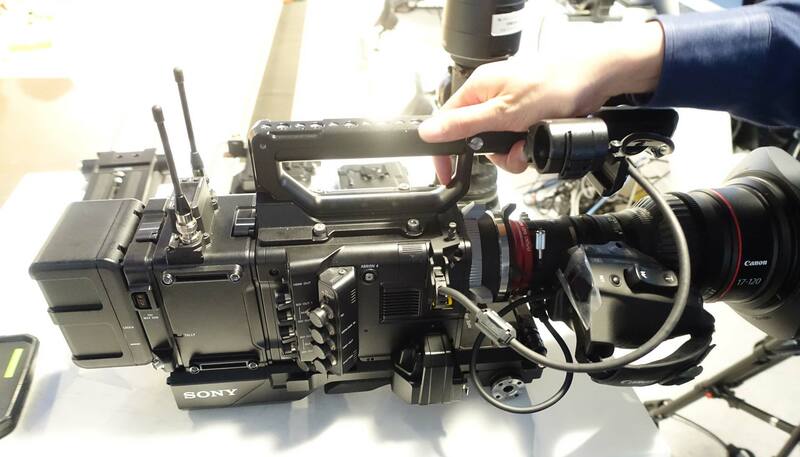 Sony showed the latest improvements on their “Doc Dock” (also known as Build Up Kit) that turns the F55 into a comfortable, shoulder-resting Documentary/ENG style cameras system. Introduced a few months as a prototype, the designers listened to suggestions from camera operators and the Dock will ship in a month or two with a much greater degree of fore-aft balance adjustment and shoulder pad position. Also, the front rosette/control has been lowered and also moves forward — thus avoiding the prototype’s problem of interfering with the lens barrels. The new Dock will accept the Sony AXS-R5 RAW recorder. And there’s a cradle for wireless receivers. Docking is simple: lower the camera onto cradle, and then secure with 3 levers from the camera right side.